There are times in the year when there aren’t many auditions for shows. During these times, I auditioned for shows that I normally would not attend because I had promised myself I would not be lazy. This particular audition I was preparing for was a musical version of “A Midsummer Night’s Dream” that a village theater was producing. They wanted rock song auditions. I should have skipped it. I did not. I went to my vocal coach’s apartment to do my final preparations. She suggested adding simple choreography to my rendition of “It’s Raining Men.” In my heart I knew it was a bad idea, but I went along with it. After my rehearsal, I applied my silver glitter eye shadow to rock it out, and went down to the village. Simply put, the audition was terrible. I forgot the choreography and stood there swaying with jazz hands. I cannot sing rock and was uncomfortable the entire time. At the end of the audition, one of the lovely casting people said, “I like your eye shadow.” Bless her heart for finding a positive in there. I have moved on from that moment, but I still love a compliment regarding my makeup. My favorite category is lip makeup. I am giddy in Sephora about trying new kinds, yet slightly paranoid about contracting Herpes Simplex 1 by trying everything. So far, luck has been on my side. I have received numerous compliments when I wear a certain combination and that is my little luxury for today. 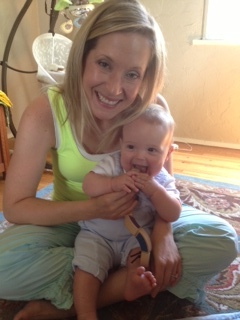 I kiss the tiny one so often that I do not get to wear lip gear very often, but I did this weekend and felt smashing. My secret combo is MAC whirl lip liner followed by Buxom lip gloss in Dolly. Dolly is hands down my favorite neutralish lip gloss. It makes your entire face a little glowy, and it tastes good. 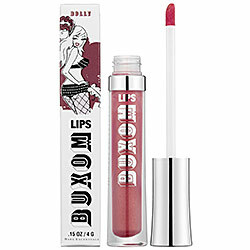 I love the entire Buxom line, but Dolly is my favorite color. At the end of the day, a compliment is a compliment, but I really prefer the kind that is spontaneous instead of someone trying to find a positive inside a huge disastrous moment. Muah! Seriously Katie…You bring a smile to my face. You are such a great writer.I can see you at your audition!